I Just Had Twins So The Shelby Mustang Has To Go! What Car Should I Buy? Christopher has a 2011 Shelby Mustang that by some miracle has not been involved in any Cars and Coffee incidents. Now he has twins and car seats and Mustangs don’t mix well, so he needs something fast with four doors. What car should he buy? 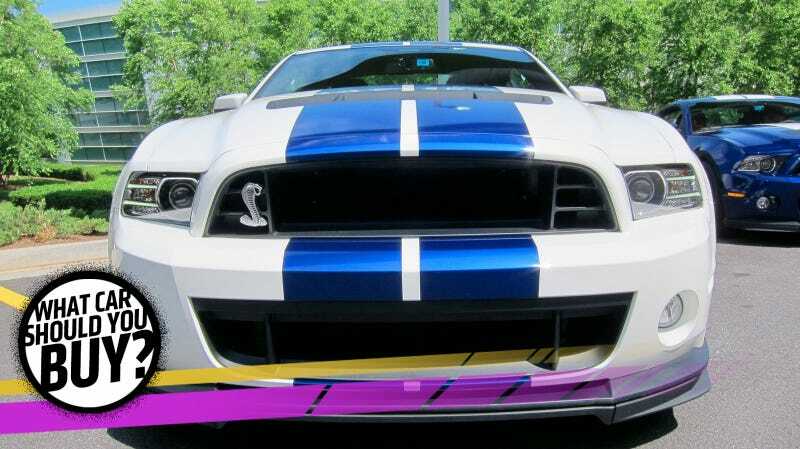 I currently own a 2011 Shelby GT500. I really love my car. Now I have 11-month-old twins and despite my best efforts (and maybe delusion) I need to get a reliable 4 door because fitting two rear facing car seats in the back of a Mustang just isn’t going to work. I’m thinking this time around I’d like to go with something a bit more luxurious, but I know I’m going to miss the horsepower. I have a budget of around $35,000 to find something with power, practicality, and comfort. The car also has to be relatively new and somewhat reliable. Christopher, I give you props for even attempting to put 11-month-old twins in a Mustang, as most folks would have given up on the dream before the kids were even born. Or given up the kids. Now the good news is you don’t have to give up muscle car power, to get something practical. While most brands are dropping their naturally aspirated V8 motors for smaller turbocharged engines, our Korean friends are keeping the dream alive. What you need is a Hyundai Genesis 5.0. That’s the same displacement you can get in the current Mustang GT and while it won’t be 550 supercharged horses hitting the pavement, the Hyundai’s 420 HP should provide plenty of grunt to put a smile on your face… responsibly. Of course, the Genesis is a midsize luxury sedan with plenty of rear seat room and trunk space. The Hyundai is also pretty darn reliable and you can score a 2015 model with less than 20,000 miles for under $35,000. Listen, Christopher, I’m going to be honest with you here. That Genesis looks good and it will try to steal your heart. Passerby will also ask you if it’s an Aston Martin. But the car is not super fun. My mom has one, and it’s been nothing but trouble for her. She even wanted to blog about how bad it’s been. You’re used to having a Shelby, so what’s going to bother you in that Genesis is all of the safety alerts. That thing dings more than the break-room microwave at lunch time (if break rooms are a thing, I don’t know, I work from home). Anyway, you like fun. You like fun cars. Get a Chevy SS. It has four doors, comfy seats and cool “SS” embroidery on the headrests. Its 6.2-liter V8 makes 415 HP, which is just a little less than the Genesis, but one comes in a manual. You know which one. The SS is also a unicorn that looks good with Holden badges on it. SS models from 2014 are now in the mid-$30,000s, so you shouldn’t have any trouble fitting within your budget on the purchase price. Being rear-wheel-drive and high horsepower, both of these cars are going to eat your tires. Sorry about that. Mom gets new back tires every 19,000 miles on the 2015 Genesis, and screams in anger every time. But there’s a price on fun, and I’d have fun all day in a Chevy SS! Hello, good sir. It appears as though we both love big V8s and rear wheel drive. I’m happy to say that twin-turbo V8 BMW 7-series happen to be in your price range, with several nice examples out there with low miles. There’s nothing as silly as breaking the rear wheels loose in a big ol’ Bimmer. Here’s a pretty 2012 750Li on Autotrader with 400 hp and only 22,565 miles on it for $31,492. You should add some more miles via smokin’ the meats. The Siebener is a car that can grow with your kids. You won’t be out of room fitting a car seat in the rear. You won’t be out of room if they’re full-size grown adults. It’s pretty comfy back there. Shoot, make them drive when they’re old enough, and take a good nap. It’s that kind of car. Our family had an Oldsmobile and a Cadillac when I was a kid, and honestly, there’s nothing better from the kid’s POV than getting hauled around in the back of a big luxury sedan. You can play it off as being the chauffeur when they ask to sit up in the front passenger seat before they’re supposed to, and they get to ride on miles of soft, supple kid-barf-resistant leather. Christopher, listen to me, dad-to-dad: you cannot get a boring car. You just can’t. Your kids are like you—happiest when they’re not bored. And I can tell by the fact that the car you’re getting rid of is a Shelby Mustang that you’re someone who does not want a boring car. Happy parents are better parents, and the way to keep you happy is to put you in something like this glorious 1972 Rolls-Royce Silver Shadow. Don’t let that naked chrome winged lady fool you—this is well within your budget at $29,000. It’s almost everything you want, too: comfortable, four doors, powerful and practical. Sure, it’s old, but it’s Rolls-Royce old, which I’m pretty sure is way better than normal car old. Besides, it’s only got 44,000 miles and it’s in immaculate condition. You’ve helped to create two entirely new human lives on the planet, and now your job is to make those lives as fantastic as they can possibly be. In those new Hyundais and Chevys and BMWs up there, their lives may be fine, but this Rolls will catapult things to that next level. The memories they’ll carry for a lifetime are about to be formed, and this gorgeous, huge, green Rolls could be the thing that makes their memories not just warm, but downright magical. I’m telling you, whatever concerns you have about maintenance or parts availability or the horror of repair will melt away when you think about those twins looking at photos of themselves in 30 years on the bumper of that Rolls-Royce. Plus, if you get stuck, it’s a new adventure and a chance to learn about amazing hand-made British cars. Plus, there’s no better way to get kids into cars than to have actually interesting cars around; I’ve been driving my son in my old Beetle since he was a baby, and now he’s the only kid at his school to ask for a Messerschmitt Kabinroller birthday cake. This Rolls is everything you want in a car, but it’s more—it’ll become part of a whole childhood mythos and help develop your kids into fascinating people, with great stories to tell. Take a risk. Get the Rolls. Just buy the damn minivan. You can get a fun car after they’re grown. Or get a cheap Fox-body Mustang to tune up when you need some away time from the kids. It’s fine. You’ll be fine. Just buy the damn minivan.